It’s a scenario that is tragically becoming increasingly frequent and less of a head-turner in Ethiopia. People living in a shared community of residents hailing from different ethnic groups saw a dispute escalate to gun battles, leading to the deaths of anywhere between a dozen and thirty people in Ethiopia’s Wollo region over the weekend. Located in the Amhara state’s North Shewa Zone, the clashes took place in zonal areas belonging to communities of both Amhara and Oromo farmers. Exactly what instigated the latest bout of communal violence isn’t clear, but residents of the area are known for being armed and unhesitant about resorting to the use of firearms to protect their livelihoods. The widespread availability of weapons obviously exacerbated things and the Amhara regional government was forced to request a prompt deployment of federal army troops. The army put an end to the weekend of mayhem and a degree of normalcy has finally returned to the area. Both the Amhara and Oromo inhabitants affected by the violence are trading blame for having fired the first bullet that initiated the carnage. Despite the various accounts, there is very little that can be substantiated thus far and most accounts circulating on social media appear to be based on hearsay. For its part, the Amhara regional government President Ambachew Mekonnen told state media that it had begun investigating the cause of the fighting. In Addis Ababa, the Prime Minister’s office meanwhile, issue a communique calling for calm and promising to take action against those proving a security menace. What neither office did was offer their own version of events. It is virtually impossible to know what incited the shootings or precisely which town in Wollo the conflict originated in, as Kemise, Ataye and others were turned into warzones on Friday. Details have been hard to come by, making it virtually impossible for foreign media to dedicate any meaningful coverage to. However, this hasn’t stopped countless people on social media from boldly pushing their theories for precisely what had transpired and who was to blame. Among the two major theories being propped up by a large section of observers and news readers is that the Oromo Liberation Front was the initiator of the chaos in Wollo this weekend. The other is that Amhara regional security forces carried out a calculated series of military moves against Oromo farmers. Some went as far as comparing the government backed Amhara security contingent’s actions to those of the murderous Somali regional Liyu Police, who under former regional President Abdi Illey were infamous for their raids of neighbouring states and their murderous pillaging of villages. 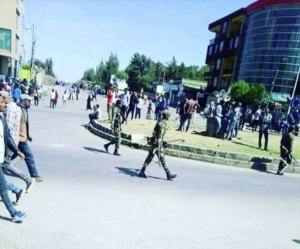 People are claiming that the Amhara security forces targeted the Oromo community in the area as part of an intentional effort to root them out of Wollo. Long deemed a secessionist group with designs on carving apart the state and creating an independent Oromo entity, the theory that the OLF were in the midst of the fray found wholehearted acceptance among many Ethiopians, some who have made this clear with their condemning of the group on social media this week. The OLF denies its forces were involved. It’s unclear if anyone has actually testified to having actually witnessed the OLF’s rank and file members in Wollo at all. Despite this, the idea of the OLF instigating communal warfare would be deemed credible when one takes into account the fact that factions of the group have spent a good part of the Ethiopian calendar year engaged in sabotage activities and firefights with the federal army. These clashes, which have mostly taken place in parts of Oromia’s West Wollega Zone, have killed countless people and caused locals to flee their homes. With the issue of internally displaced Ethiopians proving to be a real sticking point of the current administration’s first year in power, the OLF has provoked the ire of Ethiopians, including Oromos for its role in exacerbating that problem. Despite the newly appointed Prime Minister Abiy Ahmed decriminalizing the organization and opening the door to its members taking part in the Ethiopian political process, many seized upon the opportunity to return from their training camps in Eritrea only to decide to wreak havoc in their home country and spark an upsurge in violent attacks, bank robberies and assassinations. Indeed it was after the highly feted peace agreement that saw them return home from their former base in Eritrea, that OLF military activity in Ethiopia escalated noticeably. In fact, the frequency of armed clashes reached a level not attained since the early nineties and in January, the government went as far as scrambling airforce jets to bomb a suspected OLF militia camp. Desperate to cull their rising influence, state forces carried out a series of massacres and killings of civilians they accused of harbouring militants. Footage of of dead civilians and damaged property started appearing on social media feeds, giving some people the ominous impression that a new era of death and destruction, reminiscent of that of 2016 when the federal army violently clamped down on the region wide Oromo Protests, was nigh. Fortunately, violence in Oromia has subsided considerably after Oromo traditional elders, the Aba Gadas intervened and mediated a truce. The initiative saw both sides refrain from fighting, and a significant number of OLF fighters lay down their arms and head to designated camps with a government promise that they wouldn’t face any sort of prosecution. But a number of OLF fighters have refused to turn in their arms and so, an OLF menace remains. Only weeks ago, gunmen attacked a vehicle traveling near the Oromia town of Nedjo left five members of a mining company dead, including three Ethiopians, an Indian and a Japanese citizen. The Oromia Region’s deputy police commissioner blames the attack on the renegade members of the OLF, although no arrests have been made and the deputy police commissioner didn’t disclose exactly what led to them arriving at this conclusion. Prior to the OLF’s return to Ethiopia being cause of a security crisis in the region, the OLF’s on and off secessionist stance and it’s remaining firm in the belief that the Oromo culture and language were part and parcel of the Oromo identity, would have the organization demonized in Ethiopian circles. It has always been depicted as a divisive, tribal threat to the unity and security of the state over the years, even when the OLF’s operational capacity was at a minimum. It is quite easy to sell the OLF as a villainous presence to the Ethiopian public. In 2006, capitalizing on this villainous reputation of their’s among non-Oromo Ethiopians, the Ethiopian government declared that three OLF fighters were killed at a hideout in Addis Ababa after the bombs they were assembling accidentally blew up. The bombs were to be used on public facilities in Addis Ababa where they would target innocent civilians, the government said at the time. Few expressed doubt in the veracity of the report at the time. But a Wikileaks cable leaked in 2011 stated that the US government believed that there was no such incident and that the three victims were in fact dissident Oromos captured and severely tortured before being murdered by federal government security forces. Their bodies were then left at the alleged hideout. Exactly what happened remains murky, but the incident shows just how easy the narrative of an OLF bogeyman passes as truth in sections of Ethiopian society. Despite the OLF’s current and past history, one cannot deny there is a certain degree of prejudice directed at the organization and that this results in the OLF being scolded and condemned even without substantial information linking them to the scene of a crime. This is not to say that the group are unlikely or incapable to launch attacks on villages that subsequently spark inter-factional violence. As has been seen over the course of the past year, it takes very little, as little as a rumour of a church relic being desecrated, for gullible extremists to retaliate and lay siege to entire communities. The OLF do have a vested interest in Wollo. The organization have in the past issued maps of the region where the entirety or a portion of Wollo is encompassed as part of an independent Oromia. However, the odds are that the OLF had nothing to do with the weekend’s violence. The OLF’s “road trip” to Wollo? Those who have readily accepted the theory that armed OLF Shanee units ran rampant in Wollo causing the wanton destruction and killings likely did so without any evidence. Nor did they take into account the fact that the locations in Wollo deemed the epicenter of last weekend’s clashes, Kemise and Ataye, are located in the west of the Amhara region and some 800km away from Western Wollega, the stronghold of the OLF’s remaining operating forces. The above mentioned Aba Gada mediated truce between the OLF and the federal government has doubled as a tool to diminish the OLF’s fighting capacity. Although numbers haven’t been made public, a significant amount of the group’s fighters took up the peace offer and made the trek to one of several camp locations. A number of the group’s high ranking commanders also decided to adhere to the peace agreement. Among them Elias “Gambela” Golo, leader of the group’s Southern Command, took up the offer and retreated to one of the camps with his men. Among those who refused to recognize the legitimacy of the truce is Kumsa Diriba, a commander better known as Jaal Maaro and infamous for his stark opposition to a deal with the government. In fact, according to Dawit Endeshaw, a journalist at local publication The Reporter, Jaal Maaro and other remaining OLF fighters have severed ties with the Dawud Ibsa led OLF leadership based in Addis Ababa. During this period where an obvious fragmentation of the group is being witnessed, it would be unfathomable for Jaal Maaro and what’s left of his army to contemplate carrying out an operation nearly a thousand kilometers from the one area of Ethiopia that they’ve managed to fortify as a stronghold. For them to have made the trip, they’ll have to have either come perilously close to Addis Ababa city limits, or have trekked through rigorous rural terrain, all for battles in areas they’d never manage to hold on to or make strategic gains from of any sort. It would serve to bring them even closer into the crosshairs of the Ethiopian army with which they had been fighting with for most of last year and likely invite brutal retaliation from the army and risk their annihilation. At this time with fewer fighters, no leadership in Addis Ababa to negotiate them out of a hole and dissipating popularity, it would be foolhardy for the group to even consider treading that far. So why were people so quick to link the OLF to what happened last weekend despite the infeasibility of an OLF march on Wollo? Primarily, because the OLF are a great fit when it comes to the bogeyman factor as mentioned earlier. Nobody questions it, as was the case when the public was told that OLF cadres accused of plotting a bomb attack mistakenly blew themselves up at their Addis Ababa hideout in 2006. Former Prime Minister Meles Zenawi is alleged to have made a remark that when loosely translated from Amharic amounts to “when you scratch the surface of the OPDO, you’ll find the OLF.” Generally, this refers to a preconceived notion that the OLF are embedded in the hearts and minds of each and every Oromo. An Oromo farmer that has never picked up a gun or never met with the OLF could easily be labeled a supporter or worse, an underground sleeper agent for simply wearing clothes with pan Oromo symbols. Like other Ethiopian peoples, the Oromo have their own unique ideologies and viewpoints. Some of these viewpoints strongly contrast with those of differing political backings. In an attempt at denigrating Oromo political aspirations that clash with their own, some of their opponents will slam any Oromo refusal to submit to political, social, cultural norms as being born of the rebellious, counterproductive nature of the OLF. So who is responsible? It’s pretty difficult if not impossible to ascertain unless perhaps, one is on the ground investigating. This area of Ethiopia has a nearly level guns to men distribution. Keeping tabs on weapons in rural areas of the Amhara region is a virtually impossible task. Anything could have happened that sparked the clashes that tragically tore families and livelihoods apart. In a communique posted to their Facebook page, the OLF accused the Amhara regional government of mounting a security operation to cleanse Wollo of its Oromo inhabitants and attempting to masquerade its actions as legitimate by besmirching the OLF. Indeed, this is the second theory that many have pandered to. An Amhara government massacre in Wollo? But there is a discrepancy between the facts and this version of events too. Firstly, contrary to what the OLF said in its communique, the Amhara regional government did not mention the OLF by name, let alone besmirch them. Nor did it mention the involvement of any Oromo militant organization in its address to the public. Addis Standard has reported that some lower level regional administrators blamed “militiamen affiliated with the OLF.” But there has been no official state government statement naming the OLF as a participant in the breakout of hostilities in Wollo. At a press conference on Sunday, Amhara Regional President Ambachew Mekonnen offered condolences to the victims and stated that his government would get to the bottom of what happened. The Amhara regional government has thus far refrained from pointing fingers. For President Ambachew Mekonnen’s government to actively seek out the Oromo population in the affected areas for extermination, as some are alleging, he would likely have attempted to prevent external forces from entering the region and hampering his effort. All reports state that the violence broke out on Friday. Why would a regional governor hell bent on ethnically cleansing an area of Oromo, call on the assistance of the federal army, a multi ethnic force composed of men and women hailing from all regions of the country including Oromia? Why would that leader bring in these troops within a mere twenty four hours of his operation getting underway? Wouldn’t this prove to be counter productive to any said goal of dislodging a specific demographic from Wollo? It’s quite elementary. It doesn’t require extensive knowledge of the region’s political workings to debunk that theory. The Amhara regional security forces are mandated to intervene and put a stop to any such breakouts of violence across the state. Within its jurisdiction, federal army troops can only be deployed after consultation with the regional government. For the federal army to have been called in only a day after the fighting started, the situation must have been beyond its capacity to contain. But what is the likelihood that the tax payer backed Amhara regional security forces would face stiff resistance requiring federal government backup if they ambushed a number of unsuspecting armed Oromo civilians? Even with the sprinkling of assault rifles found in every home, resistance would be brief and there would have been a massacre. Not the hotly contested skirmishes that went on for two days and spilled into towns, forcing the closure of business and entire roads. All indications point to the regional security forces being caught off guard and requesting the aid of the far more experienced and well armed federal army to assist them in quickly putting an end to the fighting before the bloodshed could continue into the work week. Were there any crimes committed by the regional government? Mishaps that resulted in unnecessary death and injury? Perhaps. But the notion that there was an attempt at carrying out the sort of massacres the former Somali regional Liyu police was renowned for, is baseless. Despite this, a large number of Ethiopian social media users have capitalized on the vague nature of the details surrounding the story to lambast one side or the other for carrying out a cold blooded massacre of innocent people, something that is evidently far from being factual. Based on a despising of individuals from one or another political affiliation, people have exploited the Wollo clashes as an opportunity to engage in heated inflammatory rhetoric slamming either the OLF, the Amhara regional government or the National Movement of Amhara (NAMA) opposition party that currently holds no seats in the state parliament. The NAMA is targeted because President Ambachew is believed to sympathize with the NAMA cause. The exchanges on social media, due primarily to some biased reporting from media outlets and the influence of activists, have turned the discussion forums on the clashes into a bipartisan affair rife with unfounded claims and ethnic slurs. The bias of some outlets, including the Borkena news website, which issued this report not so subtly blaming the OLF for the tragedy contributed to the polarizing atmosphere. Oromo activists meanwhile launched the #WeStandwithWollo hashtag campaign condemning the Amhara regional government for the violence. For much of this week, towns across Oromia region have been the scene of demonstrations condemning the Amhara regional government, or in some cases armed NAMA supporters, for their alleged attempt to wipe out the Oromos of Wollo. Meanwhile, there are reports that a similar demonstration was held in the Amhara regional city of Debre Birhan, where marchers called for the federal government to take action to stop the OLF from killing Amhara civilians. The bullets have stopped flying and the army is patrolling the streets and plains that were a battleground over the weekend. Calm has been restored and residents are going about their lives. And yet elsewhere in the country and abroad, people’s refraining from analyzing the facts and their tendency to side with the popular narratives being nurtured by the kin of their constituencies, has them at each other’s necks. The mob mentality has taken over, with people willing to pick up a pitchfork and join an angry mob without knowing why or towards where they are marching, so long as the mob consists of ideologically identical people. Logic isn’t taken into consideration when the opportunity to belittle your foes and show your undying devotion and loyalty to a cause are up for grabs. Wollo is symbolic in so many ways. It is a multi-ethnic society that with most residents descending from Amhara and Oromo lineage, or both, as in Wollo, the two peoples existence’s have been intertwined for quite some time. The region’s inhabitants are also renowned for having no qualms with inter-religious marriage, something traditionally frowned upon elsewhere in Ethiopia. In many ways, the lifestyle of the Wolloye population reflects the values of tolerance, coexistence and pluralism that in recent times have been lacking in some parts of the country. To see what in many eyes is deemed as the last bastion of hope in this regard come under attack by gun toting trigger happy men is disheartening. It’s a relief, to say the least that the violence was put down rather quickly. However, it is extremely worrying to see how the general lack of emotional restraint among far too many Ethiopians with access to information and resources, has led to the clashes being depicted as something far more sinister and nefarious than what they truly were. What happened in Wollo this weekend should bring people together to iron out the kinks in armour that has never been penetrated by ideological difference. Instead, as has been the trend in recent times, it has resulted in another bout of factional cyber inner fighting. The bickering online by proponents of one of several conspiracy theories has ironically served to polarize Ethiopians on a scale larger than what the armed men actually involved in the heated gun battles over the weekend, could have ever attained. The vitriol, the hateful rhetoric and the warmongering have drowned out voices of calm and reason yet again. Anarchy thrives when people are unable to dissect a storyline without looking past their own factional leanings. It’s becoming a sad phenomenon needing societal discussion and a joint initiative at tackling. But until then, it seems that throwing in one’s two two cents isn’t complete without issuing a stinging criticism of an individual or individuals, all too often needlessly. Adhering this norm, I’ll sign off with a parting shot of my own here: during these times of division, where is the so called “unity” camp? Previous Post 2020: Opposition’s Political Myopia to hand EPRDF victory on a platter?